Footing is that part of substructure that ultimately transfers the load (dead/live/wind/seismic) to the supporting soil in such a way that the safe load bearing capacity of soil is not exceeded (refer to table 1 for estimation of the safe load bearing capacity of the soil). 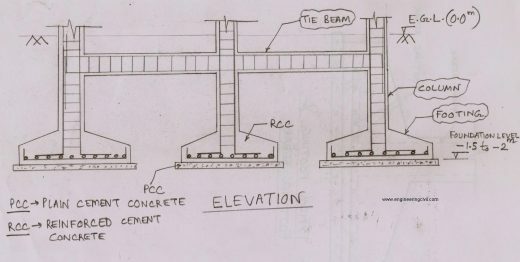 Footing is a structure constructed in brick work masonry or RCC (refer to figure 1) under the base of a wall or RCC column for distributing the load over a large area. The most important part of footings is the plan dimension, i.e., the bearing area which is ultimately resting on the soil and dispersing off the building load to the underneath soil. 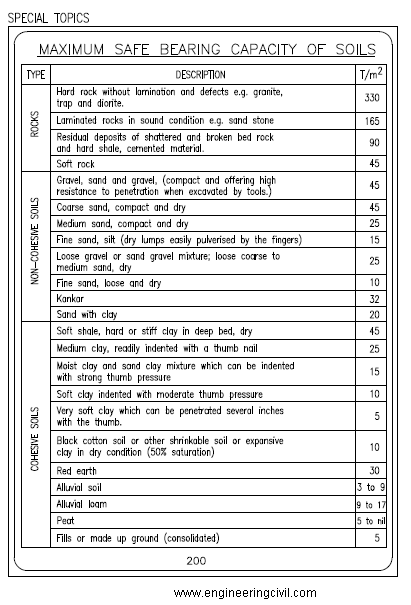 The plan dimension of footing is determined by the nature of soil, as from the chart of safe bearing capacity of soils (refer to Table 1), it is evident that footing resting on rocks will have less plan dimension compared to that resting on soft clay or fine sandy soil. RCC Footing should have a minimum depth of 150mm for footing on soil, and minimum 300mm above the top of piles for footing on piles. 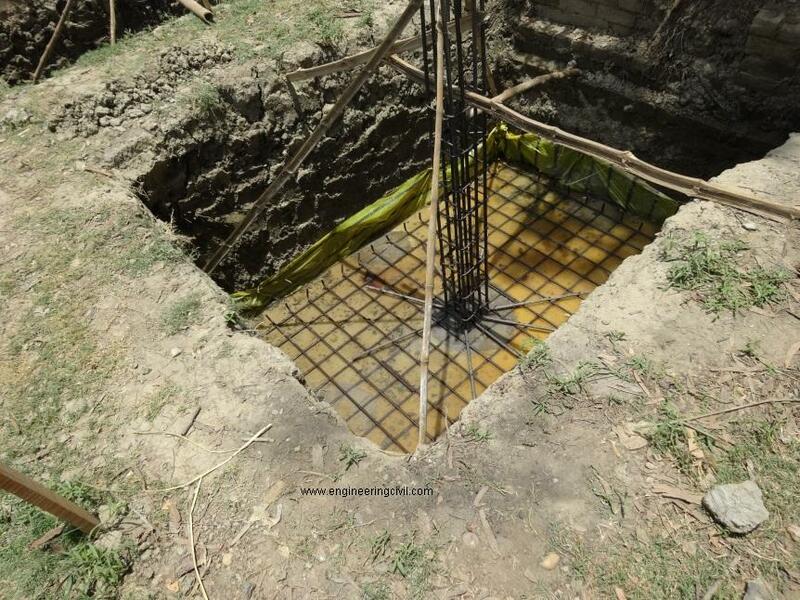 Minimum clear cover (concrete cover from outline of concrete to outline of steel) for footings is generally 50mm. 1. 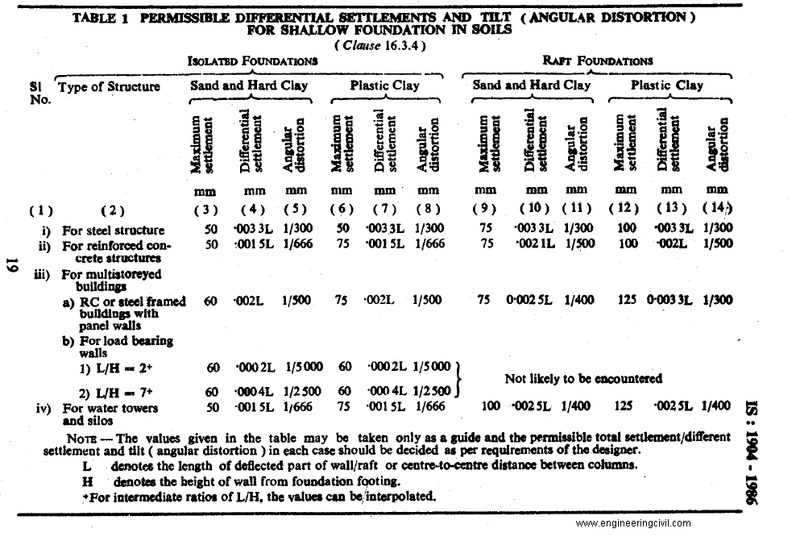 Total settlement of the structure should be limited to values as specified in following table 2 [extracted from IS1904]. 2. 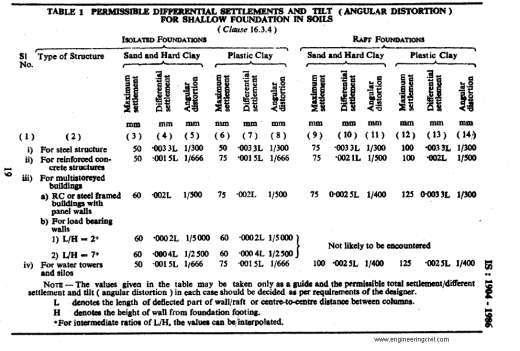 Differential settlement (difference in total settlement) between different footings should be avoided as far as practicable, and should be limited to values as specified in following table 2 [extracted from IS1904]. 3. Footing should be designed and laid at the level where safe bearing capacity of soil is known from soil testing report. 4. Centre of gravity (CG) of the footing should coincide with the CG of loading. 5. Stress distribution under the footing should be such that the maximum allowable stress should not exceed anywhere under the footing. 6. Nowhere tension should be allowed to develop under the footing. Eccentricity check for footing should be performed. 1. Footings are the only means of transferring structure load to underneath soil. 2. Footings, once laid, are a part of substructure and can’t be repaired or changed in the entire life span of a structure. 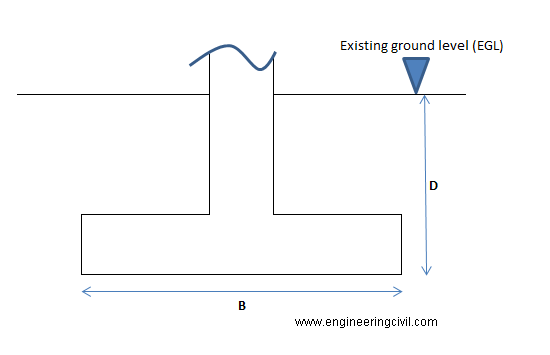 (i)	Shallow foundations: Generally laid at 1.5–2m below the Existing ground level (EGL) when D (depth) ? B (breadth). (ii)	Deep Foundations: when D > B. (ii)	Combined footing: Combined footing is a preferred choice for high storied construction where isolated footings are not suitable. It is generally provided where the bearing capacity of the soil is not sufficient to sustain the load from isolated footing due to its limited plan dimension, or when the footings are spaced so closely that the stress distribution at the bottom of footing overlaps and thus might cause localised failure/ settlement of building. It is one common footing for 2 or more columns. Refer figure 3 for details. (iii)	Strip footing: a combined footing where all columns in a row or column are combined together. (iv)	Mat footing: A combined footing for all columns of the entire building (refer figure 4). Used when stress distribution at bottom of strip footing overlaps, thus might cause localised failure/ settlement of building. a)	Timber pile: (i) Straight pile, (ii) Battered pile, (iii) Combination of both. 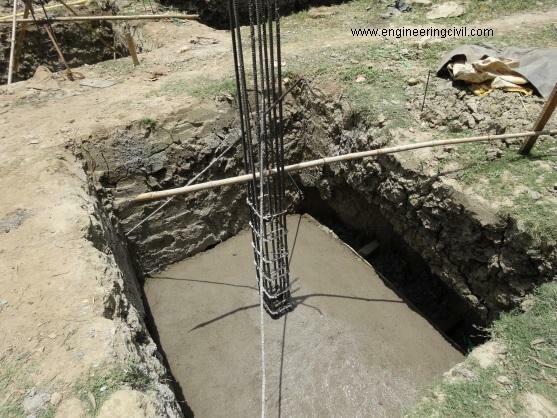 b)	Concrete pile: When pile is used to transfer load to huge depth. Types: (i) Precast, (ii) Cast-in-situ, (iii) Under-reamed pile. Depending on nature of load transfer, types: (i) End bearing pile, (ii) Load transfer by skin friction or frictional resistance. •	Sl. No. (ii), (iii) and (iv) are used in bridge/industrial construction only. 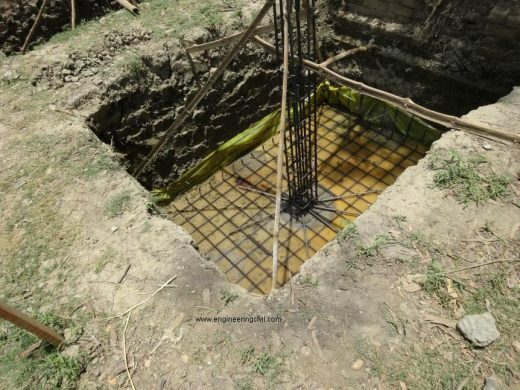 •	Deep foundations are used when there are weak soils near the surface or when the loads are very high, such as very large skyscrapers. •	Piles are driven inside the rock for fixity, so those entire building loads coming from columns are transferred to rock. 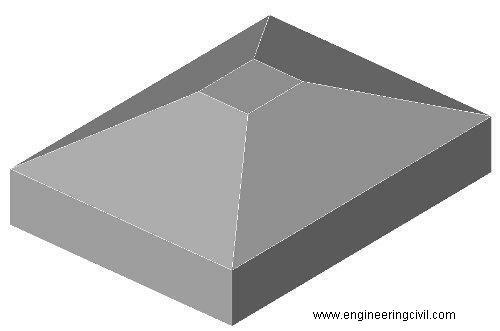 Pile cap may also be isolated or combined just like shallow foundations as shown in figure 5. 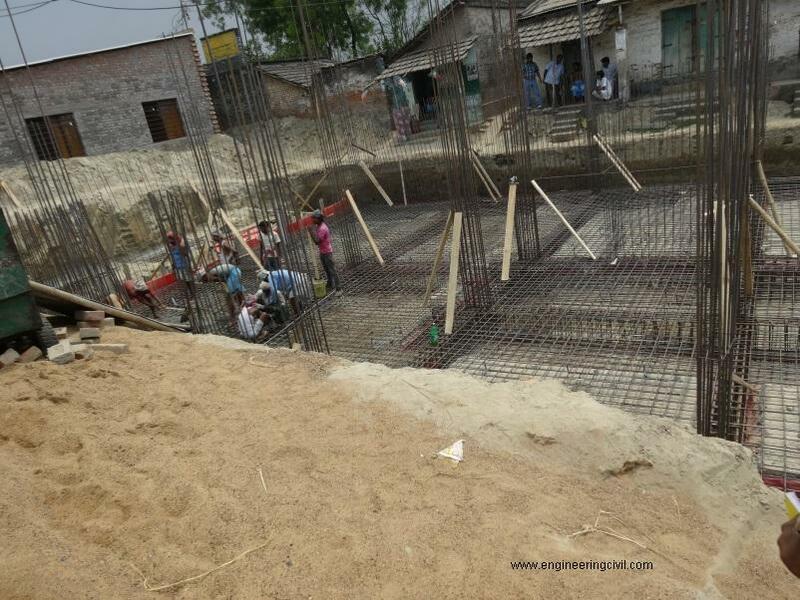 (1)	Foundation depth and plan dimensions are many a time compromised at site. It should not be done without prior approval of design engineer, as it might lead to local settlement/overturning of the structure. 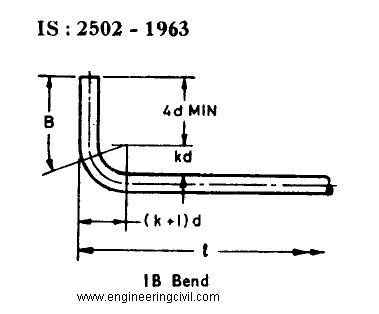 However, it may be noted that in structural design engineering we never design for end bends, and it is only provided considering safety, as the bend is likely to resist overturning more than a simple straight rebar due to its bonding with concrete. (3)	In the case of such bend provided, it is to be done using proper mandrel of minimum diameter of 3d and maximum 5d [d=dia of rebar]. If proper mandrel is not provided, it might lead to improper bend causing bar weak in failure, with visible cracks on rebar. (4)	Minimum grade of concrete used in footing should be M20. (5)	Water should be pumped out before casting footing in a water-accumulated pit, since water-cement ratio of concrete will increase, which decreases the strength of concrete. How does pressure distribution vary under rigid and flexible footings?